Treat yourself with compassion – Where's my paintbrush? I’m finally painting again, thanks to a lesson in self-compassion that I received after attending my third seminar (out of four required) in UT’s Human Dimensions of Organization “Thinking Smarter” certificate program on November 13. I’m hoping to guest blog for HDO’s In the Loop as I have in the past, so I’ll hold off revealing all the reasons why the latest course – Behavior Change and Influence – had such an impact that I picked up my paintbrush in earnest again. The course is based on instructor Art Markman’s new book, Smart Change. I recommend picking up or downloading this book now and using the Thanksgiving holiday to begin working through it. You’ll be more than prepared for the desire and pressure that arrives every December to develop and activate New Year’s goals if you start now. Dr. Markman opened the class with a truth we all intuitively know: We are sent out into the world after college to think and motivate and influence without knowing a thing about psychology – how minds work, how people think, and why they behave in certain ways. The premise of these HDO seminars is that we would live better lives if we knew how our minds work. Understanding how my mind works got me motivated to paint again. There are many reasons why it’s been hard for me to paint the last year, but they boil down to the fact that I acquired new habits during and after my mom’s fight with pancreatic cancer, which also coincided (in the same month) with the end of my art classes as my instructor Michael moved to Kansas City. Dr. Markman explained that our brains are designed to spend as little time thinking as possible. So when my environment changed drastically with my mom’s illness and the end of art classes, my behavior changed with it. No classes meant no set time to create art. And as I dealt with the stress of my mother’s illness, I couldn’t find the energy or joy to paint. Not painting became the new habit, and so it’s been for a year, as I fell into what Dr. Markman calls the “what-the-hell effect”. We’ve all been there: this is where you elevate the failure of a specific accomplishment (“I didn’t show up to the easel again today”) to the status of the failure of an entire contribution (“I can’t be an artist”). Dr. Markman’s class and his book helped me see that the path to changing my behavior is straightforward but not easy. He also helped me see that I need to have more self-compassion. I must look at my failure to paint the last year as a combination of things that were out of my control and the actions that I took or chose not to take, not as an assumption that there’s something fundamentally wrong with me or my ability. I’ll write more about the lessons of Smart Change in future posts. But today, I want to close with the message of self-compassion and encourage my readers to reflect on it, along with gratitude, this Thanksgiving holiday. In deciding to treat myself with compassion as I make my way back to the easel, I chose the most compassionate subject there is for my new painting. This week, I completed a study of George Rouault’s Head of Christ. The blogger The Ohio Expressionist was lucky enough to see the original up close. 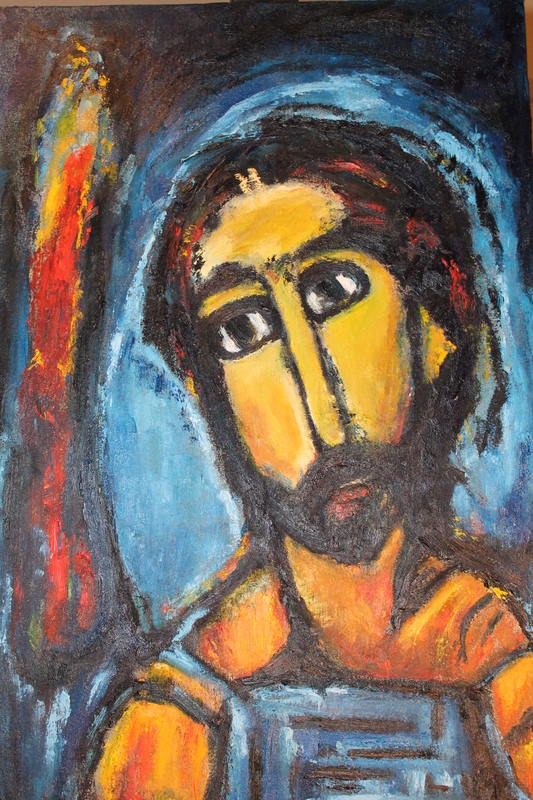 He remarked, “Rouault’s Christ looks me in the eyes until he finally has my attention, and says, ‘I suffer with you. I love you. '” Regardless of your religious beliefs, I hope that you enjoy my study of this beautiful painting and that the message of self-compassion resonates with you this holiday. Happy Thanksgiving. Hi Teresa, thanks for this post. I consider time I spend outside of the studio as time spent building reserves for when I can pick up the brush again. I consider it part of my process, part of the ebb and flow of a life. Thank you, Catherine! The ebb and flow of life: That is such a wonderful way to look at it and to acknowledge it can be part of the creative process. I, unfortunately, was beating myself up, so I’m glad you have had that self-compassion to know when it’s okay to take a break from the studio without believing it’s an overall failure. I’m going to do a better job at that! My name is Richard Sharp, a retired professor of American Literature who grew up in Kent, Ohio. The painting on your blog you titled “Teaching Self-Compassion”—obviously by a naive artist—is me. The person you refer to as “The Ohio Expressionist” is myself at age 18 when I painted that “Self-Portrait” (as I called it) in 1965 and entered it in an art show; I forget who bought it. But you are exactly right in saying it teaches one self-compassion, and I am so pleased you are able to use it for that purpose. I always wondered what happened to it, as I love Rouault’s “Head of Christ” which I go to see whenever in Cleveland. I’m glad you can utilize it to further your good work. But please do not sell it! Out of compassion for me, the artist, give it free to anyone who is touched by it. (I think I asked $25 for it). Art, like love, should be free. I welcome any comments you might have. Dear Richard, the painting on my blog is a study I did of Rouault’s Head of Christ, and The Ohio Expressionist is an artist named Kevin Casto. I’m not sure why you sent this strange comment claiming my study is yours and claiming to be Mr. Casto. All the paintings on my blog are originals or studies of the masters or well-known contemporary artists that I painted.